I've spent the last week in label sticking, envelope stuffing miserableness, so you'll have to forgive me for my lack of blogging. However, I'm sneaking in one last recycled project for The Altered Element DT - a super cute, fringe necklace made with the beads from some 'recycled' jewellery and some rather lovely, leather thong. I have a massive collection of beads that I've saved from broken necklaces or from old and outdated pieces that I've found at my local car boot sale. I've been wanting to make a necklace using some of the larger beads for quite some time now, but couldn't find a leather thong thin enough to fit through most of my beads. To make your own version of this necklace you'll need at least two metres of leather thong, some recycled beads (or maybe a selection like the Dress It Up Beads which come in a wide range of colour mixes.) You'll also need some end caps, some jump rings and a lobster clasp to finish your necklace. To start, simply cut one piece of thong to the desired length of your necklace, then cut additional pieces of thong to a variety of lengths for the fringe. 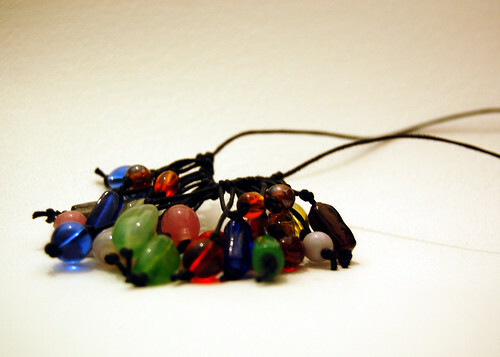 Add beads to each smaller piece of thong and then, keeping the longer pieces towards the middle, add them to your main length of thong using lark's head knots. To complete your necklace, fasten an end cap to each end of the necklace, then add a clasp using a couple of your jump rings. Done! So pretty! Love all the color. I get a kick out of "car boot" I don't know why, it just makes me giggle. In a nice way, not in a stupid American way.